If you are a complete beginner, then you should learn the pedal kicks on some flat surface before you try to pedal hop over some dodgy gap. It's all about pedal control, braking power and balance. The pedal kick is an essential technique for chaining up quick bursts of power into the drive-train. Nicolas Agyemang kicks his way across successive gaps. The pedal kick is the basis for transitions on the rear wheel with successive pedal hops and it is used in a vast majority of bike trials techniques. For optimum kicks, you should position your feet with the ball resting on the pedals. This will give you extra leverage when using the spring of your ankles. Ratchet up your front pedal for a powerful kick. Starting from a trackstand position, ratchet up your front pedal and pre-load your front foot. Crouch slightly to ease the front wheel and then release the rear brake to give a firm but brief kick in your front pedal. During the kick, move up on top of the driving pedal into a full jump impulse while pulling the handlebars to your abdomen. The pace at which you spring up into extension is what will determine your thrust and momentum. 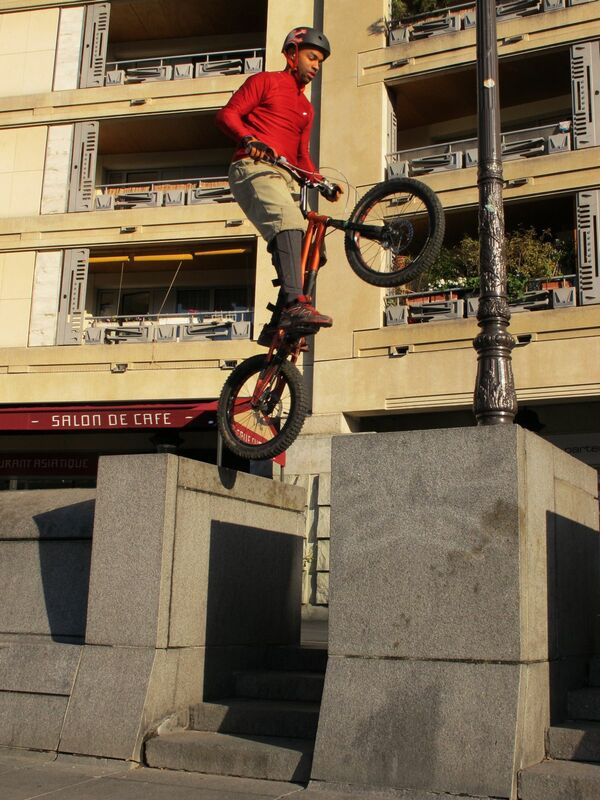 Without this jump impulse, you would only be lifting the front wheel without taking off the rear wheel. The kick propels the bike off the ground to stand up on its rear wheel. Block the rear brake immediately after the full kick to secure your next position on the rear wheel. From that standing position, let the front wheel drop a little bit by leaning forward, and before the front tyre touches the ground, release briefly the rear brake and give another kick in your front pedal to propel the bike off the ground. 1° Ratchet up your front pedal and pre-load your front foot. 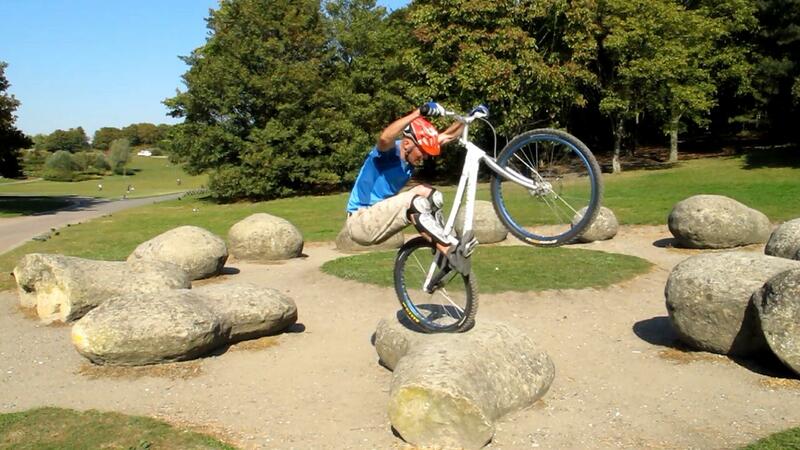 Crouch slightly to ease the front wheel. 2° Release the rear brake to give a firm but brief kick in your front pedal and move up on top of the driving pedal into a full jump impulse. 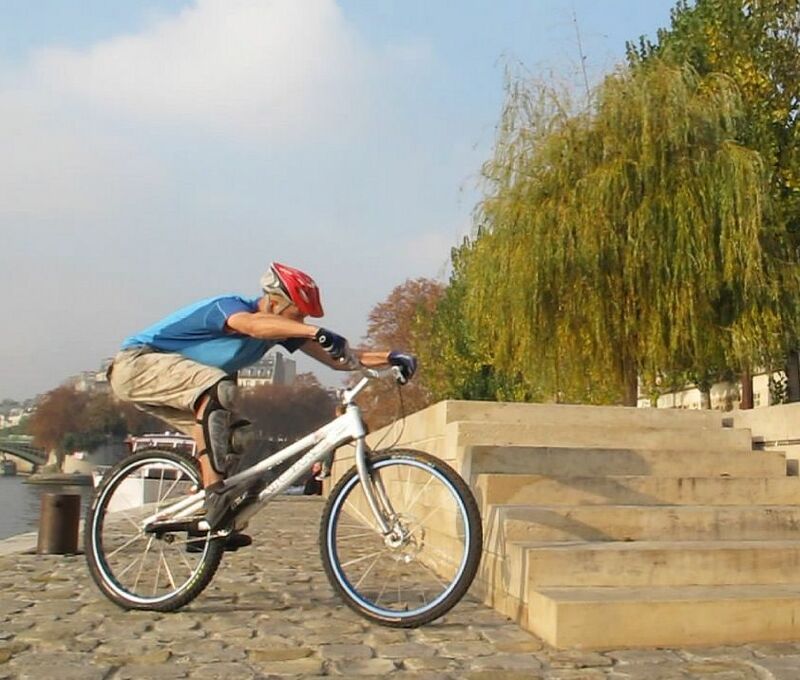 3° The kick propels the bike off the ground to stand up on its rear wheel. Block the rear brake to secure your next position. 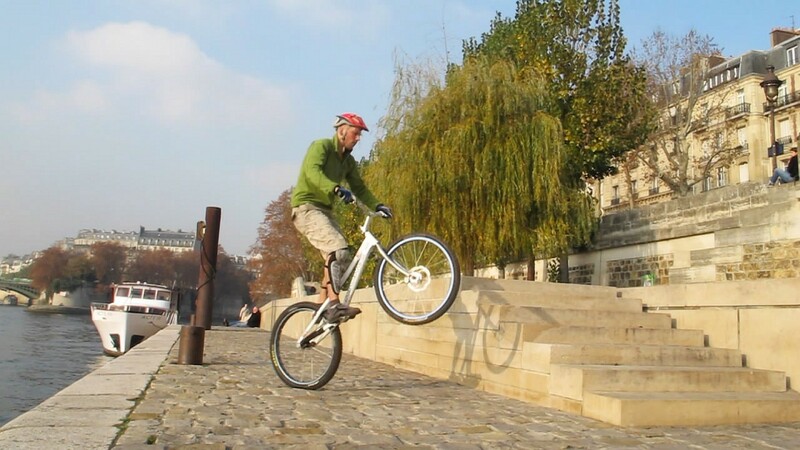 4° Landing on the rear wheel, let the front wheel drop a little bit by leaning forward on your momentum. 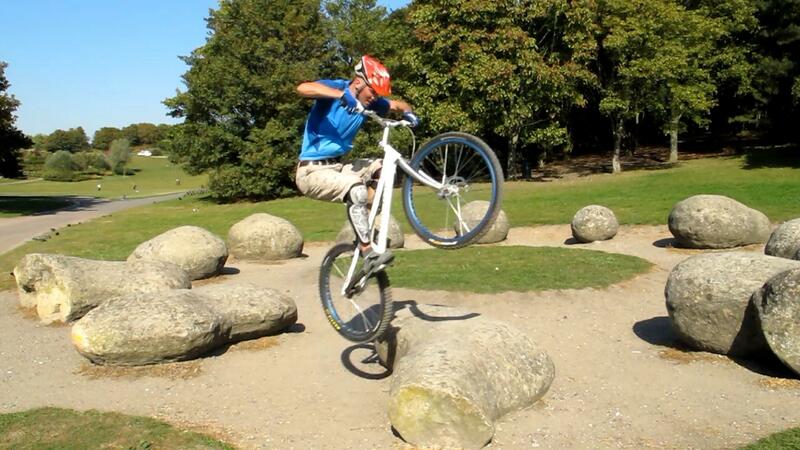 5° Jump again on top of another pedal kick and release briefly the rear brake to propel the bike off the ground. 6° In the air, pull up the bike with you and keep the bike standing up with the rear brake locked to secure your landing. A pedal hop across two bollards. 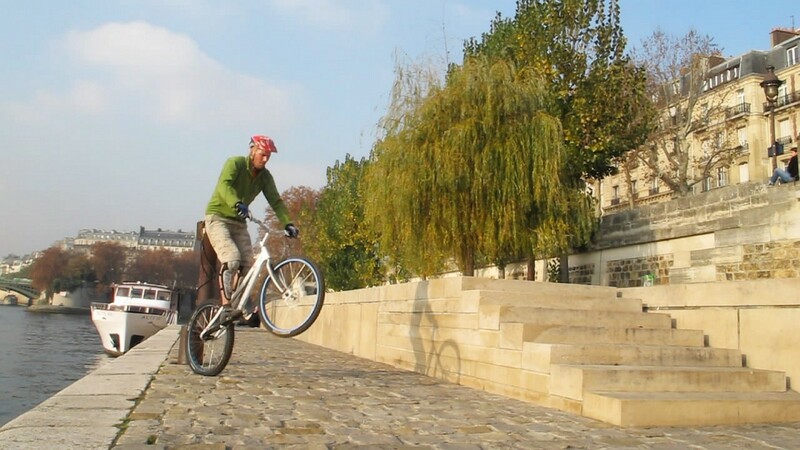 The pedal hop is just a vigorous pedal kick boosted with a higher level of commitment and more rebound during your jump so as to take the rear wheel completely off the ground. You can boost your pedal kick with the natural bouncing effect of the rear tyre (low pressure helps). 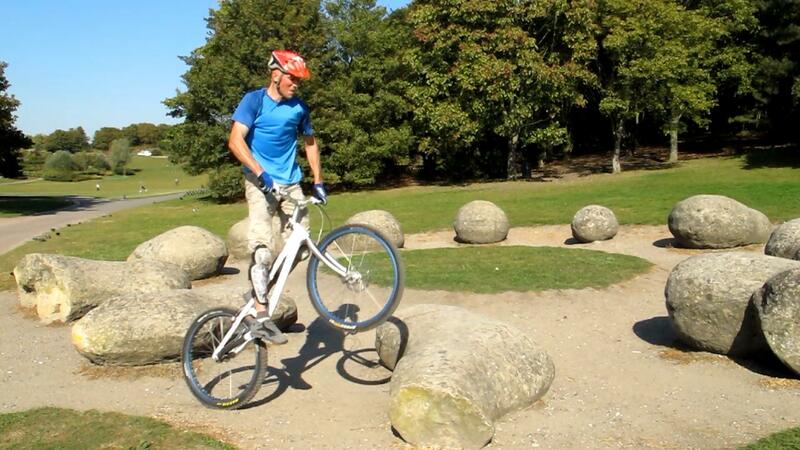 One incentive for giving a more energetic kick is to aim your rear wheel at a small kerb. You can truly boost your pedal kick by energetically pulling the handlebars to your abdomen (arms stretched) as you move up on your front pedal. This allows you to leverage the whole bike as a cantilever, augmenting the total torque input while helping you thrust your hips forward (and your centre of gravity) on top of each pedal kick. What's more, pulling the bars to your abdomen eases your way up and literally catapults you during your impulse. The powerful cantilever effect moves the bottom bracket up, and so the pedals on which you are standing to jump. The acceleration builds the momentum you need to truly move forward and lift the bike with you. Finish off the extension by firming up your arms and tucking your knees, effectively lifting the bike in front of you. A pedal kick with no built-in momentum would only propel the bike to stand vertical in front of you, and you may not be able to hold the balance. For a longer reach, look at synchronizing the action of kicking the front pedal (to accelerate the rear wheel), with the thrust of your hips forward. In a full extension on top of the pedals, finish and boost your kick using the spring of your ankles. For this to work well, you must position your feet well back on the pedals. 2° Thrust your hips forward (and your centre of gravity) on top of the pedal kick, pulling the handlebars to your abdomen. 3° Finish off the extension by firming up your arms and tucking your knees, lifting the bike in front of you. 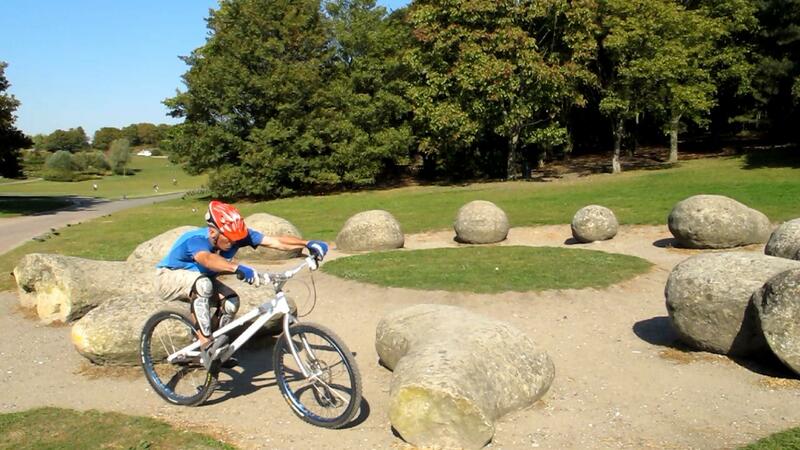 4° As you pull the bike up, aim your rear wheel at the obstacle in front of you to secure some grip. Let the momentum drive you forward and repeat the previous steps to chain up pedal kicks for as long as you can. Practice and practice again until you can chain-up at least two or three pedal kicks in a row. Of course, each time, you must re-adjust your pedal position and ratchet up the crank so as to be ready for another kick in your front pedal. It takes a while to control the rear brake and release the back wheel just in time for the next pedal kick, or block it again to avoid a crash on your back when you have reached your balance position. Lowering the front wheel gives you more leverage and helps you control or compensate the front wheel lift generated by the kick. 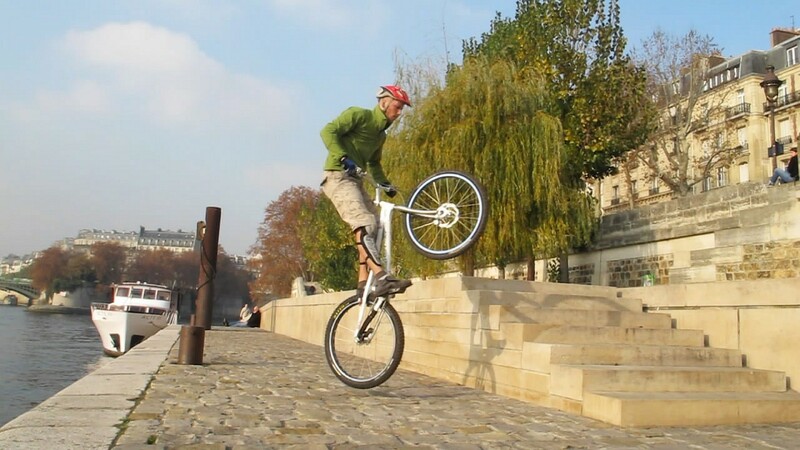 When you are confident with this technique on a flat surface, try it one step down from a small kerb or up a small step.